Greetings forum! I’ve been lurking for a little while and figured I’d finally start a thread to introduce myself, ask questions, and probably ramble a bit. I’m a 39 year old geologist (read: outdoorsy and loves beer) with two little kids and an awesome, (thankfully understanding) wife. My family duties take up a good chunk of my time, so the majority of my weekday riding has been after dark. I just started riding at the beginning of January 2016. One day I was looking at unicycles on C-list, then I found videos of people riding muni and I felt something I wanted to do. Two weeks later I was staring at my new 24” Club from UDC. I honestly have no idea what led me to unicycles. I had an old, 16” unicycle from Sears when I was a kid which I was able to ride a little bit before it broke. I never replaced it and never gave another thought to riding in the intervening 25+ years. Given my stated interests, the 24” Club is probably not the best choice, but it provided an affordable starter that can hopefully take a little abuse while I hone my skills. I am quite happy with it, and I figure if I can ride something on my Club, it’ll be that much easier when I get a true muni. In short, the journey so far has been surprising and AWESOME! I love the exercise, I love the focus that riding requires, and I love how relatively easy it is to incorporate into my already busy life. Riding nearby trails on a b*ke is boring, not so on a unicycle. My skill progression is geared towards muni. By the end of January I was able to ride forward and steer. By the end of February I had learned the “tire grab” free mount, was working on climbing hills, and was riding easy trails XC along the river. At the end of March I was able to climb while holding the front of the seat, and I figured out how to stall and bunny hop. So far in April I now have a reliable “hands-free” static mount, and I regularly do a 2-mile loop on weeknights and 5-6 miles of trails on weekends. While the progression of major skills is immensely satisfying, I find what keeps me coming back is the small moments of improvement I notice on just about every ride. For example, last night I surprised myself by leaning and pedaling smoothly around a corner that I have normally made by an abrupt “torso-turn”. The turn was finished before I even realized what had happened and it made me break into a wide grin. These moments are the best. Anyone else experience these? One other question: what next? I plan to keep working on climbing and hanging onto the saddle, and I need to smooth out my static mount so that it is more useful on narrow trails, but what off road skill should I learn next? Thanks everyone! And happy riding! Welcome and sounds like you're doing great! I have almost the same story. I am 49 and bought a club 24 in January also. I got hooked and also bought a KH 26 and an Impact trials. I ve been working on idling and riding backwards. I have a lot more confidence practicing new skills on the smaller trials uni. I lent my club to a friend to try and hopefully get a riding partner. I too don't have much time between work and family life. The trials uni is nice to just play in my driveway or on my deck for 15-20 minutes of free time here and there. I ve gone on trails 3 times and I'm hooked. Although the first time I basically took the uni for a walk in the woods. The second time was much much better and I attribute that to the extra saddle time I did between muni rides. I can't wait to go again . I love how relatively easy it is to incorporate into my already busy life. Riding nearby trails on a b*ke is boring, not so on a unicycle. similar here. It's perfect for getting in a great workout with not so much time: With 3 hours I can do an awesome muni ride and completely exhaust myself (on the bike I would need all day which is rare with the family). Or with 1-2 hours I can take out the trials uni in front of the house and maybe ride with my girls on their bikes. Thus, I get in 2-3 rides/week, sometimes more! While the progression of major skills is immensely satisfying, I find what keeps me coming back is the small moments of improvement I notice on just about every ride. These moments are the best. Anyone else experience these? I honestly believe I could write a one-page report on the new things I learned and my progression for EACH and EVERY ride I've done, which is about twice a week for 5+ years! That's amazing I think. hmm. short estimate: 40 weeks/year (accounting for bad weather) x 2 rides/week x 5 years = 400 one-page reports! Hmm... for the most part with muni I would just try riding new trails or new/different lines. If a rooty/rocky section is too hard now, keep working and it'll be possible soon. If you really progress and your local trails get too easy, then try switching to shorter cranks: It's like hitting reset and everything will again be harder - mounting, bumps, etc. -- but you will be faster! or of course a bigger wheel (I've been riding my 36er on my local trails recently). Sounds like you're doing everything right! Nice progress. Ride on as many different surfaces as possible. Grass has a lot of variability in camber at any particular point, it provides uneven rolling resistance, and it's nice to fall on while trying things like jump mounts (which helped me gain a lot of confidence). Other than that, grass is a huge waste of water and a bourgeois status symbol. Most of the technique I have on my larger, mUni wheel, I learned on a 20". The biggest game changer for me, mUni-wise, was getting both hands on the bar ends. My cadence improved, I was more relaxed because my arms were no longer flopping around, my hips became more involved in steering, I could ride very narrow trails, and my hill climbing ability improved. By the way, I first learned seat-in-front skills on the 20", then was able to transfer that skill, immediately to the mUni bar ends, once I installed them. So, my advice is: work on holding the seat with either hand, then later with both hands. At some point, you'll be able to ride into momentary still-stands, then ride out of them. For the time being, practicing that technique will cause UPDs, but you'll improve. Sometimes mUni involves losing momentum, and the key to staying on is to perform a brief still-stand. I like the following quote, which is at the bottom of every post by skilewis74. I'm new here too. You sound like you're dong fantastic. I bought a 26 Club road uni in mid-January. Kind of big, especially for me, but my thought was that I didn't want to have to buy anything bigger to get the exercise I was hoping for. I learned to ride fairly quickly and was hooked. I'm now also pointing towards mountain unicycling, so despite my efforts to avoid a second purchase, I will be taking the plunge soon I hope. I put a knobby tire on my club as soon as I was off the tennis courts. It has been sufficient so far on the grass, and trails that I have been starting on. Good luck and have fun! Post your progress. I love reading what others are doing. It's very motivating. Those moments of success are the best! I lent my club to a friend to try and hopefully get a riding partner. Yup, I was thinking of doing exactly the same thing. I’m not quite ready to upgrade just yet though, I plan to wring every bit of capability out of my Club first. I feel like if I don’t explore its limitations I won’t fully appreciate what a true muni can do. I’m inspired by the image of George Peck weaving along a cobble strewn beach, but I’d like to avoid his handful of broken axles. If you really progress and your local trails get too easy, then try switching to shorter cranks: It's like hitting reset and everything will again be harder - mounting, bumps, etc. -- but you will be faster! I love this. The unicycle is such a simple machine, which means that adjusting only one factor slightly (crank length, tire pressure, tread pattern, etc.) can have a profound effect on performance. So, my advice is: work on holding the seat with either hand, then later with both hands. Yes, this is likely where I’m heading next. I can hang onto the saddle with my left hand when I’m climbing, and this lets me crank down harder on the pedals and keep the wheel pointed where I want it. I can definitely see the advantage of getting another hand on the saddle for climbing, and also just for riding in general. The less arm waving for balance the better I think. Every once in a while everything clicks and I’m able to flow through a section of trail with relaxed arms, shifting my hips for balance. It feels awesome when it happens, almost like dancing, but it is currently a fleeting experience. I put a knobby tire on my club as soon as I was off the tennis courts. Hooray for another beginner! I also put a knobby on my Club when the stock whitewall failed (finally, I hated it.) I found it much harder to ride on as it had a ridge in the center which was tricky to balance on so I switched back to a Kenda K-Rad. However, I found that my fine balance improved dramatically during the week that the knobby was on. I feel like unicycling came along at just the right time in my life. Sure, I wish I had more free time and more disposable income, but it’s exactly what my body and mind need right now. Thanks again everyone! Now back to riding. Greetings Geolojas, from a fellow Sacramento area rider! There are possibilities of not riding alone in your near future. I had an old, 16” unicycle from Sears when I was a kid which I was able to ride a little bit before it broke. I had a similar start in unicycling, with possibly the same unicycle. Solid plastic tire? When mine broke I also didn't replace it until several years later, after finishing my learning to ride on a Schwinn 6-footer belonging to a neighbor. That was 1979, and I'm still at it. I figure if I can ride something on my Club, it’ll be that much easier when I get a true muni. Absolutely. I started out in Muni with regular 24" unicycles, maybe with the addition of a mildly knobby tire. It was many years before I got one with a 2.6" tire, which changed everything. Many of my favorite trails got too easy! But I found harder ones. By the end of February I had learned the “tire grab” free mount, was working on climbing hills, and was riding easy trails XC along the river. Yaay! If I may ask, which part of the river is your local area? Caution: many of the dirt sections within the Sacramento/Rancho area are off limits to bikes, so rangers or indignant hikers/horse riders may give you a hard time. Tons! Not so much these days, but I haven't been pushing myself. Most of my riding is of the Road variety, on a geared 36". Most of that tends to be on the American River Bike Path, where I work on improving my speed and shifting skills. I am still gradually improving in my 37th year of unicycling! What skill(s) to learn next? Work on smooth, leaning turns. Smooth pavement is best for that. Thanks for the kind welcome John. I do look forward to some day actually seeing another unicyclist in person, let alone ride with one. Maybe i should take it in stages, I don't want to overexcite myself. As for my first unicycle (16" Sears, maybe even 12"), I found these pictures of one that someone just posted for sale on another site. I recognized it immediately, and I am almost certain its the same model as what i had. If i remember, it failed at the bearing brackets. If I may ask, which part of the river is your local area? Caution: many of the dirt sections within the Sacramento/Rancho area are off limits to bikes, so rangers or indignant hikers/horse riders may give you a hard time. I am located in midtown Sacramento, so my local trail riding is primarily on the levee roads (and the graveled levee access ramps, which are short, but great practice). I have also been nervously exploring a few of the dirt trails along the river bank. Sadly, after digging deep into the Sac County regulations, I think you are correct as to bikes not being allowed on these trails. For the time being, I'm going to stay the course, smile , be very polite, and try not to irritate anyone. So far, reactions have been positive, but I have yet to encounter a ranger. Thanks for the feedback, and joking aside, I do look forward to meeting and riding with you at some point. Wow, your old Sears is vastly identical to the P.O.S. I started on. Yours has an upgraded seat though (made by Messenger; same company that made the older generation Schwinn seats). Mine also failed at the bearing holders. What genius thought a single bolt would be a good idea? Oh, one with an accountant for a boss. I don't think anybody expected people to actually ride those things, and I still believe they damaged a whole generation of potential unicyclists by being such pieces of crap! They left people feeling unicycling was much more difficult than it should be, by being super-hard to learn on, and then falling apart if you started to actually ride them. All you unicyclists out there; if you haven't tried one of those, you may not realize the effects of a solid tire, really short cranks (but wide stance, or Q factor), tiny little tricycle pedals, and NO BALL BEARINGS. With weight on it, the wheel takes quite a bit of effort to turn. Kudos to you, Geolojas (and any others) for not giving up way back then! I'm going to stay the course, smile , be very polite, and try not to irritate anyone. That goes a very long way. Don't crowd anyone, and mostly they won't be bothered. Plus I think the park gets less "regulated" and possibly less ranger attention in the midtown/downtown area. Unfortunately we don't have much going on in the Sacramento area for entry level riders, just the occasional group rides I put together, and possibly some practices by a small group that (may or may not still) meets in Granite Bay. I can connect you with that group's leader if you're interested; he's a former Olympic coach (rowing). I was feeling worn out and cranky yesterday, so i wasn't going to go for an evening ride. The weather was perfect though, cool and calm, so I ended up riding after all. Just a short one I said. Endorphins are such wonderful things. I felt better almost as soon as i was up and riding and had one of my strongest rides in a while. I only had one UPD on my 3 mile loop (on one particularly tricky hill with a low-hanging branch) and I noticed that my crotch was getting a tad sore on the return trip. I've been working on SIF riding, and while I don't have it quite yet, I can stand up and ride. I stood up and rode standing on the pedals for a while, and when I sat back down all the discomfort had vanished. I was ready to go again. I guess a little stretching and blood flow back to the region every once in a while does wonders. What is the average speed you can expect to achieve on a 24" wheel with 127mm cranks? I expect the answer is a range depending on the experience of the rider, but I'm curious as to what is possible. I rode almost exactly 3 miles last night, and averaged just over 5 mph, which was about my best average speed to date. Anyone else have any other data? I think most people that ride over a few miles are riding something larger than a 24", not to say it can't be done, or shouldn't. If I'm doing any distance on a 24, it's for Muni, and then I would say 4-6mph is about right, but I have 137s on the 24". I have only gotten data from group rides though. If you want to get faster, you can definitely bump those cranks down a size or two. I was feeling worn out and cranky yesterday, so i wasn't going to go for an evening ride. The weather was perfect though, cool and calm, so I ended up riding after all. Just a short one I said. There's something to be said for low expectations! I've had a few like this, unicycling as well as running and skating. We probably get a nice gradual warmup at the start while still deciding whether to go ahead with it or not, which helps a lot. I've been working on SIF riding, and while I don't have it quite yet, I can stand up and ride. I stood up and rode standing on the pedals for a while, and when I sat back down all the discomfort had vanished. I was ready to go again. I guess a little stretching and blood flow back to the region every once in a while does wonders. Definitely. Being able to shift around and get some fresh blood down there really makes a difference. What is the average speed you can expect to achieve on a 24" wheel with 127mm cranks? I expect the answer is a range depending on the experience of the rider, but I'm curious as to what is possible. 6 mph or so is tops for me. There are forum members who have gone a lot faster but I think usually with much shorter cranks. Sounds like you had a memorable ride. Way to go! I did up a spreadsheet and colored in the similar values for easier visualization of similar gain ratios. The comments at the bottom are just what I think the various ratios would be suited for. The chart also demonstrates the jump in wheel sizes between 29 and 36. I wonder if that gap will ever get filled? I used nominal values for the wheel sizes and a gearing ratio of 1.5 for the geared numbers but it should be good enough to give people a good idea of what kind of gain ratio they have in various setups. Hello from a another fellow Sacramento area rider! Sounds like your having a lot of fun progressing on the local dirt trails, I also learned on the American river dirt trails and never ran into any Ranger issues. There's a few low commitment rides around Folsom lake that are also great to learn on and easy to walk back from if your too tired. I would just encourge you to ride over every little rock, stick, and sandpit you can find and that'll help your overall skills a lot. Oh, forgot to list an actual speed for comparison. On my 14km (9mi) commute my moving average is about 18km/h (11.25mph) with sustained bursts up to 22km/h (13.75mph) on a 36 with 127s. On the one hand, on a 36 it's probably easier to maintain a speed because of the momentum of the large wheel. On the other hand it takes more strength and guts to go faster on the large wheel (on the small wheel you don't need much strength but just the max cadence). 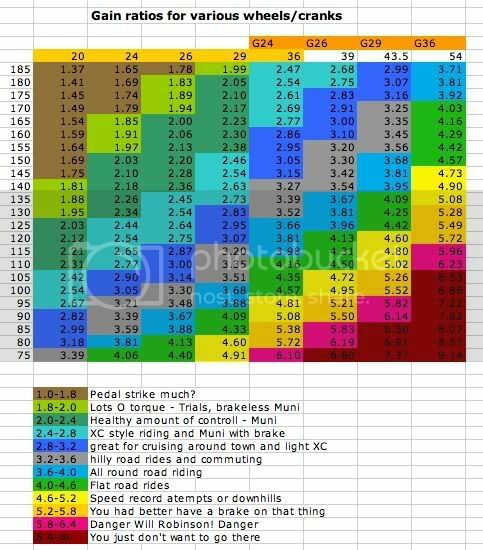 Like juggleaddict, I don't have any data on smaller wheel sizes on the road as on my 26, 24 and 20 I only ride off road or trials and generally try to avoid distance unless it's getting to the trailhead or trials spot. After so much time on the 36, for me the 26 with 125s is so incredibly slow for road, and with 150s it's almost painful (how slow).